About Pride Painting, Inc., Charlotte, NC | Pride Painting, Inc.
Back in 1996, two professional painters got together and decided to fill a need in the Charlotte, North Carolina area. Bob Bass and Mike Palladino have over 30 years of experience with residential and commercial painting. 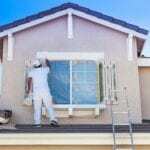 Seeing the need for quality painting services that were completed exceptionally well, we joined forces and opened Pride Painting, Inc. Our goal was to be the painting service that you can always trust for exceptional interior or exterior painting at your home or business in Charlotte. We take customer service very seriously, ensuring you have a pleasant and rewarding experience from day one through completion. We stand behind the products we use and offer a 3-year written guarantee on our workmanship, so you can have peace of mind that your painting project will be done right and to your complete satisfaction. We have often had our clients tell us that calling us was the best thing they ever did because we took the “pain” out of painting. You can count on us to arrive on time, get right to the task, maintain an organized work area that protects everything nearby, complete the job in a timely manner, and clean up afterward so that the only way you know we’ve been there is that you see the amazing transformation that has taken place. Let us take your walls from “blah” to “bravo”! You will fall in love again with your home or business. Get started today by calling us for a free estimate and/or color consultation, so you’ll know just how affordable it is to give your home or business the facelift it deserves. We take pride in what we do, and it shows!